A gusty windstorm apparently damaged the power distribution system; power has been out since 4am Saturday morning. At 11pm it's still out, and no word on when it'll come back on - news reports say that at least a hundred thousand households are without power right now. So power is on my mind right now. I actually have two different needs for power; one for the house, and one for the farm. The farm power backup needs to be 3phase power, the house single phase, and the difference is mostly in cost. 3 phase is more efficient running pumps and heavy equipment -- refrigeration and water pumps being the biggest consumers - but single phase is cheaper to install, and about as efficient when you're talking about normal day-to-day uses. I installed a 1,000 gallon propane tank a little over a year ago; it's enough capacity that I can run a whole-house generator 24 hours a day for about two weeks. If I ran the generator 8 hours a day this fuel supply would last about 6 weeks. Propane is also used to heat the house, and to heat water. With this large a tank I only have it filled once a year or so. I chose propane because the fuel stores well and is relatively cheap. If it sits in the tank for a few years it won't degrade like diesel or gasoline. I've installed an on-demand water heater to reduce the usage of the fuel, but unless it's a major catastrophe I'm pretty happy with this fuel supply. I've got a 12,000 watt autostart generator that is propane-fired, and that powers the house. It's primarily the freezers and heaters and hot-water that this powers; a few hours of operation per day keeps everything frozen solid. I have a lot of freezers and I'll typically have a half a cow, a pig or two, and a flock of chickens in the freezer at any given time. Want to make sure that it all remains good. To power the farm I'm going to need a 3 phase generator, and I've been looking at various options. For that purpose I'm leaning towards a diesel-fired generator. Diesel engines, cared for, last a very long time. And I usually have between 200 and 500 gallons of diesel around the farm, so in a pinch I can operate a diesel generator for several months. The diesel fuel gets used by the farm equipment, and that keeps it from getting too old. Whole foods 5 step(r) animal welfare rating: Would my farm qualify? The standards that whole foods promotes in their meat overall are fine, but there are several cases where they apparently want you (demand that you) kill animals that could otherwise be salvagable by transferring to another farm, for instance, and they prohibit "split" operations. In other words, your whole farm is managed per their specs or you can't be certified. There's also no mention of cost for certification, but I presume there's fees for this, too. I was reading the local paper and spotted an article comparing two grocery store chains for prices; trader joes (r) and whole foods (r). Given whole foods reputation for high prices ("whole paycheck") I wasn't surprised that the article found that whole foods was about 30% more expensive. "...With whole foods you are getting a higher-quality product as the chickens are non-GMO project verified, free of antibiotics and come from farms rated for animal welfare by the GAP 5-Step program"
I'm pretty skeptical about industry claims in general, and it's often worth finding out what these standards mean -- but most consumers don't. In fact prior to this article I had no idea that whole foods had an animal welfare certification system, as I never shop there; mostly because there's no whole foods within 30 miles of my house. This articles author apparently just accepted the statement from the retailer unconditionally. So I'm going to look at the GAP 5 step rating system and see how my own farm does - would I qualify? Whole foods summarizes the steps on this page., But that's not the standard. 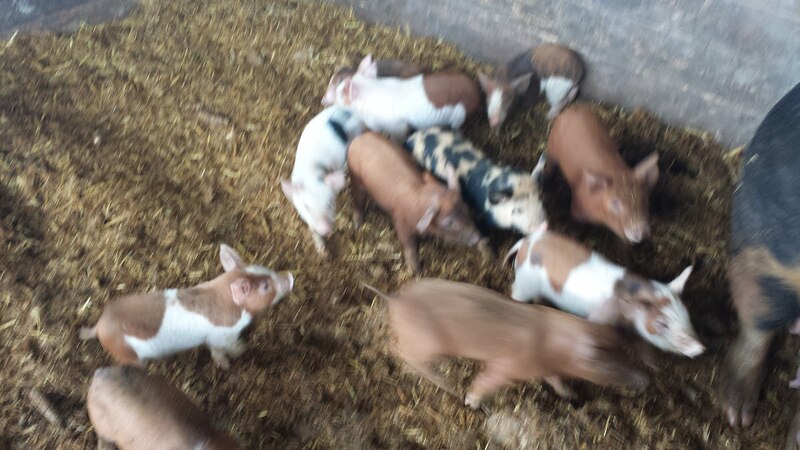 Each species has its own standard, but I'm going to look at the pig standard and see how my farming practices rate. This is a pretty detailed standard, and that's actually a good sign. If you're going to have standard it might as well be detailed, right? We want the largest number of piglets to survive. Most of our sows do great in an 8x10 or 8x12 farrowing pen, and we'd actually prefer them to have their pigs there. We can monitor their progress, check the welfare of mother and pigs, and each piglet gets access to mom at all times; the sows, for their part are pretty content. If we just used farrowing pens we'd be able to be certified. For the sows that have trouble with mothering, are too agressive, (either with their pigs, with other sows or with the farmer - me) or have an issue that requires treatment of some sort, I use a farrowing pen as an alternative to culling the sow. The sows are in the farrowing pen long enough to make sure that their pigs get a good start -- usually 3 weeks -- and then go to group housing with other sows with piglets. Group housing can be in a building, or on pasture - we do both. I find a farrowing pen to be a useful management tool, and I much prefer it to just killing the sow, which is what I'd have to do if I were to eliminate a farrowing crate as an option. rule 1.3.6 states that pigs with hernias larger than a grapefruit must be killed -- they can't be transferred to other farms, or sold as step-rated animals. This seems odd, and wasteful. Hernias happen from time to time, and honestly, we market them as BBQ pigs for the most part. Requiring the farm to kill the animal and prohibiting the transfer or sale to another farm seems arbitrary. rule 1.4 talks about the ways to kill a pig, and specifically rules out gunshot for the smallest pigs. That seems a little arbitrary, too. You can beat it to death with a hammer (blunt force trauma), but a gunshot is against the rules. rule 2.6.2 seems really concerned about tail docking. We don't routinely dock tails, but we do if a customer asks us to. But pigs do bite each other, and other than the ears, the tail is the only part that sticks out. So now and then a pig will lose either a bit of its tail to another pig, or its whole tail. you've got to have a written intervention plan for tail biting. Potential cause for the outbreak? Sow in a bad mood. A squabble over a particularly desirable place to sleep. Pigs establishing or maintaining their pecking order. You want to know why whole foods pork is so expensive? This sort of record-keeping is part of it! 3.2 talks about feed, and apparently prohibits the use of dairy to feed pigs - mammalian by-product - or the use of fish or fish meal, or the use of any animal-derived feed. If you buy pigs raised on a step-rated system, my guess is you're getting corn-and-soy fed pigs only. 3.2.8 talks about "edible forage" being presented to the pigs, but then lists stuff that is really not edible as examples - like corn stalks. Hay is marginally edible. 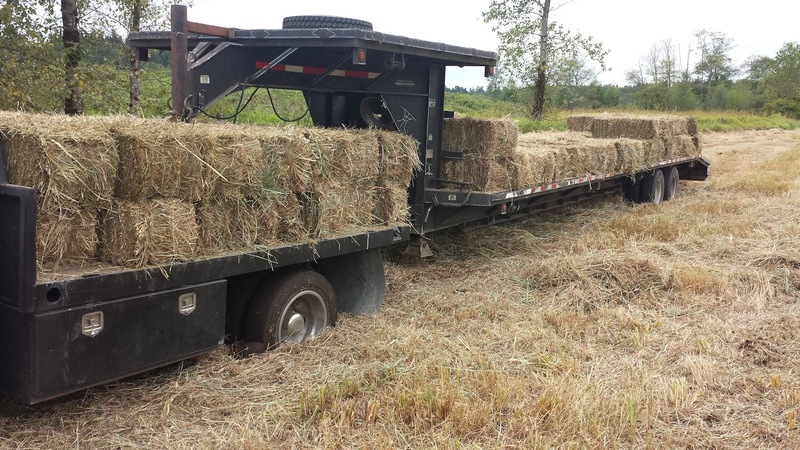 My farm provides both hay and sawdust as bedding and access to either pasture or crop residue. 4.7 talks about farrowing space; they require 48 square feet; I provide 96 or more square feet to my sows in the farrowing pens. I actually consider 48 square feet - their standard - too small, especially for large-frame sows. But I will say that in total it's an awful lot of record keeping. With a retail price of $18/lb for a pork chop, I'm hoping that the farmers get a substantial cut of that. The recent stock market disruptions have caused the usual purchases of corn for export to be disrupted. 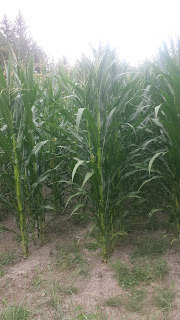 The corn crop was pretty good this year, but corn is not being purchased for export as it has been in the recent past. Right now the sale price of corn is about the cost of production, or maybe a little bit below the price of production. So farmers across the midwest are scratching their heads and trying to figure out how to make a profit. Which is where my pig operation comes in. When corn prices are high, the price of pigs (and cattle) goes down. the basic idea is that if you have a pile of corn you can decide to sell the corn as corn, or to sell the corn as meat. If the price is high, the corn is worth more in front of the animal. If corn prices are low it's worth more behind the animal. So with lower corn prices I'm seeing higher prices for pigs, which is what I'd expect, and then I see lower prices for pigs, and the lower prices seem to be based partly on the panic of the stock market, particularly the financial trouble that china is going through right now. I like it when pigs get cheaper. I saw this sort of stuff in 2008 and 2009 -- and taking the long view, I expect people to still want pork chops and bacon next year, but the markets seem to forget that from time to time. So I'm buying pigs right now when the price dips. I'm not buying beef cattle (although normally i might buy a few head) because I think that beef cattle are very, very expensive right now. I'm selling steers at prices that I've never, ever seen. Now I've only been in the market for 8 years, so I don't have much experience, but I just can't figure out how people are going to make a profit when they pay $2 to $3/lb live weight. Unless steak goes to $12 a pound and stays there. And it may, but I don't know enough about the beef market to trust that. On another front, I am buying some stock. I'm buying Potash Corp because I think that it's a good time to buy. I don't have any connection to them other than as a stockholder. They are the lowest cost producer of fertilizer components, and when corn prices are down, people aren't buying much fertilizer. It depresses the stock of companies that supply it, but I view this as a problem this year, or maybe next; my intention is to hold the stock for a few years and see how it goes. I like this company in particular because they've just spent billions upgrading their operation, and they pay a 6% dividend right now; so you do get a return even if the stock doesn't appreciate much. I'm not an investment adviser. You should do your own research and figure it out. I'm just saying what I'm doing right now: buying pigs and fertilizer stocks, selling steers. The last few days have seen a hazy sunshine; the smoke from the fires on the eastern part of the state. On the map above you can see the smoke being blown from the east to the west, which is contrary to usual wind patterns. 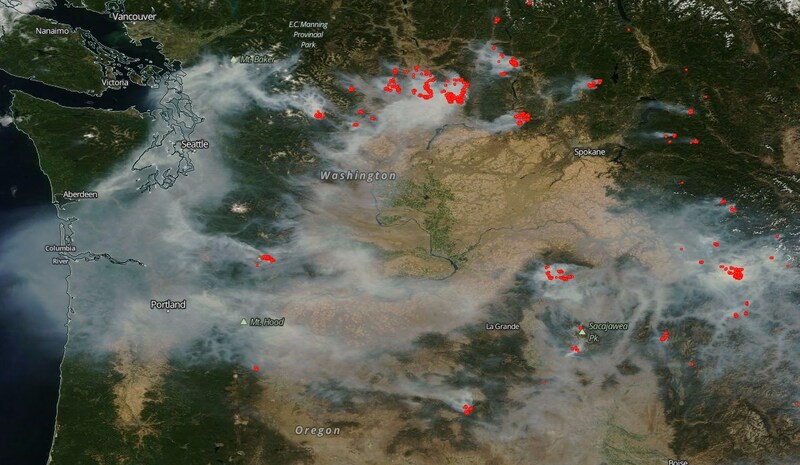 The smoke that I'm seeing on my farm is from the fire just above the "W" in Washington. From what I understand the total number of acres burned this year is basically average -- which is hard to tell from the coverage of the fires. I guess fires make a good news story. The conditions around here are pretty dry; but we haven't had a good lightning storm for a while, and that's what usually causes the fires that get big. Smaller fires, like homes or accidental, are usually a few acres. It takes a lightning strike in a remote area usually to get a fire that goes for hundreds or thousands of acres. Part of the reason that this years fire season is "average' is that we have a large burn, or several, every year. last year it was the Carlton Complex fire, which apparently is the largest wildfire in the history of washington state. Fire safety for me means that we keep vegetation and most fuel for fires away from the buildings. It's a pretty simple rule, but its easy to forget in the rainy area I live in; I see a lot of houses surrounded by fuel, and this time of year, with the drought conditions we have, it's ready to go. Things on the farm are good; the crops are growing and the pigs are squealing and the cows are... well, they're kinda quiet -- enjoying the alfalfa, which is growing great! 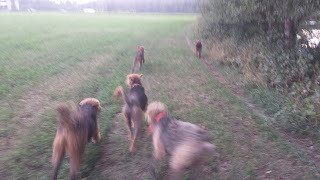 The dogs patrolling the fence line with me. August is partly lazy -- watching the crops grow -- and partly busy -- cutting, drying, baling and stacking hay. It's also the time to do all of the work that you really would rather do when it's 80 degrees out and sunny, and not 40 degrees and raining and windy. Which means that I took a walk around the fenceline and noted the places where the fence needs work, and took at look at the crop conditions. I planted some alfalfa earlier this year, about 10 acres of it, and it just didn't do very well at all. I'll probably disc it and try again in a week or two. The ground looks dry, but that truck is up to its axles. Punched through into the mud. Part of the hay that we put up is bedding hay. We've got volunteer stands of canary grass that grows in lower, wet areas, and honestly, it's pretty nice forage for cows when it's young and tender. But towards the end of its life it's a little closer to bamboo or straw. We can't harvest it easily when its young and wet, but at this time of year the ground is dry enough we can go and bale it and stack it in the barn. We'll use it for bedding materials for sows having piglets, and to provide roughage for the cows if the alfalfa is too rich. It also provides a windblock inside the barns, which makes it cozier for the animals. 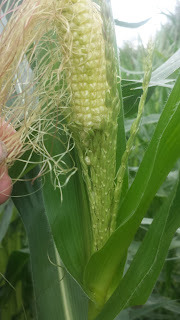 Some of the corn is doing a weird thing. It's got corn cobs growing on the tassel part of the corn. Only a few percent of them are doing this, and they've got normal ears farther down, but its odd. We're on schedule for the corn to be ripe around september 1st. September is usually a fairy warm month, so I'm crossing my fingers we get the right weather to dry the corn on the stalks.